In Egypt, Who Sees Viral Videos? The video above went viral. It was seen by millions of people, in Egypt and abroad, and perceived by many as a “game-changer” in the struggle between the military council and the protesters. 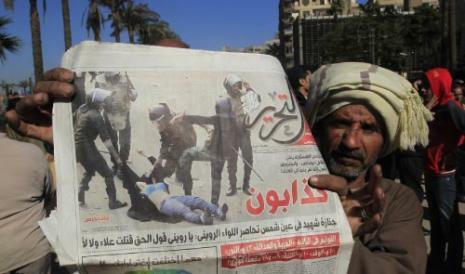 A man holds up a copy of Al-Tahrir, one of the independent newspapers that reported the incident. is a dangerous force capable of exhibiting real contempt for Egyptian citizens and the values they hold dear. Are “the masses” sharing this video? Is it circulating in the media nodes in which most Egyptians live? The independent media—newspapers like Al-Masry Al-Youm, Al-Yawm al-Sabeh, Al-Tahrir, and Al-Shurouq–have reported in detail on the incident captured in the video and reactions to it, both domestically (the women’s march) and internationally (Secretary Clinton’s angry speech denouncing military violence against civilians). And the clip is all over the blogosphere and social media networks. But state media has reported in the most perfunctory way on the incident and focused instead on footage reportedly shows an attack against the Parliamentary building housing the people’s council and the torching of a number of governmental buildings. The television ran the video several times and incited against the rebels. For their part, the private channels carried a number of videos showing the attacks of the “Military Council’s forces.” They also hosted analysts to comment on the events. But the dialogues seemed timid and they attempted at convincing the public that both sides are wrong. Of course, these channels disregarded the fact that this is a conflict between one side holding power and another side that possesses nothing but its body and the rocks it is using to defend itself. For instance, the front headline of the Al-Wafd daily was, “Army liberates the council of ministers.” As for the Freedom and Justice newspaper, it just ignored the events. Sixty-six million Egyptians do not own computers or smart phones. Millions do not have access to the satellite networks. 23 million cannot read a newspaper. One of my wife’s friends wrote that her bawwab [a doorkeeper and handyman who resides in the building he looks after] did not believe that the military would attack civilians or disgrace a woman. When she showed him the video he was appalled and angry. And he was desperately curious as to what else he did not know. He asked her to get him a computer. The power of a video like this is demonstrated in the bawwab‘s reaction. Its failure to circulate is demonstrated in his disbelief before seeing it. Activists are not unaware of this problem; many hit the streets with photo printouts to show people what the military did. The Women’s “March of Anger” on Dec. 20 (see below) also alerted many to what had happened. Mediated communication is essential to democratic process in any community greater than a few thousand, as it is the central means through which people come to know of, and share, diverse social experiences and to collectively come to recognize the common good. But media ecologies are complex things flowing across landscapes contoured by power relations and economic disparities. The original uprising drew tens of millions from all walks of life together because hatred of the dictatorship of Hosni Mubarak was ubiquitous. Eventually, even word of mouth circulation of messages was able to overcome state media’s endless and increasingly unbelievable propaganda. Hatred of the military council is far from ubiquitous. The question as to whether the protesters are legitimate freedom fighters continuing the revolution or dangerous hooligans destabilizing Egypt’s already fragile social structure is a very real question in peoples’ minds, and the answer will largely depend on which niches they inhabit in Egypt’s overall media ecology. And as long as the state media continues to define its role as it always has, as the voice of the people in power, the military council would seem to have a real edge. I’m wondering, though, whether it’s reasonable to expect that a single video (or indeed a single photograph, book, article, etc.) will be a ‘game changer’ – even in media-rich countries? Shouldn’t we add this video to a growing list of media ‘texts’ that cumulatively *could* eventually turn the popular tide against the military regime in Egypt? I’ve speculated recently – in the context of Spain’s indignados movement – about the potentially important part played by a long tail of ‘niche virals’ in the emergence and impact of a protest movement. A thousand small virals (including word of mouth virals) reaching an average audience of, say, ten thousand citizens, can pack a punch. I agree, John. The idea that any single video — or other text — can utterly transform the public sphere is naive. And yet it’s part and parcel of the utopian discourses that surround a lot of the discussion of social media in contemporary narratives about the revolutions. At the same time, part of the problem for the protesters is the scarcity of such visceral images. There was an interview with one of the businesswomen who organized the Women’s March of Anger and she was saying that this image was all they had to galvanize public consciousness about the potential dangers of the military. So perhaps this leads them to put more hope into its effects than might be reasonable.